New Printable Coupons! Windex, Zyrtec, Clairol, Schick, Visine, Purina AND MORE! Here are the printable coupons that I see that are new this week. Make sure to take a look at what we have here and print the ones you like. Some may last a while and some may disappear quickly. As a reminder, you can print two of each coupon from each computer/mobile device. 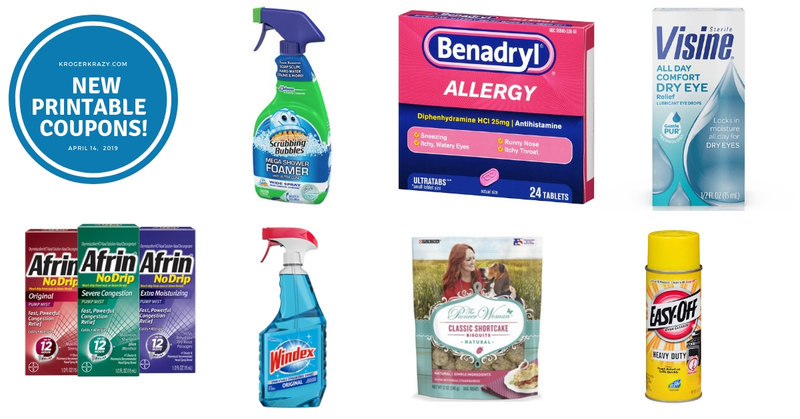 SAVE $1.00 on any ONE (1) all® product (excludes trial size).Expires 4/28/2019.Save $1.00. Save $0.75 when you purchase ANY ONE (1) Ritz Crackers. Valid on 7 oz or larger, excludes RITZ Crisp & Thins and Toasted Chips. .Expires 5/8/2019.Save $0.75. Save 75¢ when you buy any (ONE) Musselman’s® Squeezables Apple Sauce (any flavor).Expires 5/31/2019.Save $0.75. Save 75¢ when you buy any ONE (1) 46/48 oz jar of Musselman’s® Apple Sauce (any flavor).Expires 5/24/2019.Save $0.75. Save $2.00 when you purchase ANY ONE (1) CeraVe Baby Products. Any variety. .Expires 7/3/2019.Save $2.00. Save $2.00 when you purchase ANY ONE (1) CeraVe Cleansers. Any variety.Expires 7/3/2019.Save $2.00. Save $1.50 when you purchase ANY ONE (1) Atkins® Meal Bars or Snack Bars. Excludes Atkins® Protein Wafer Crisp Bars..Expires 5/9/2019.Save $1.50. Save $0.50 when you purchase ANY ONE (1) Ragu Pasta Sauce. Valid on 16 oz. or larger, any variety. .Expires 6/12/2019.Save $0.50. Save $1.50 when you purchase ANY ONE (1) Select Atkins® Shakes. Valid on any 4 pack. Excludes Atkins® PLUS Protein & Fiber Shakes..Expires 5/9/2019.Save $1.50. Save $3.00 when you purchase ANY ONE (1) Ocean’s Halo Korean BBQ Sauce. Valid only on 355 mL..Expires 5/9/2019.Save $3.00. Save $5.00 when you purchase ANY ONE (1) Billy + Margot® Refrigerated Rolls 5 lb. Any variety. .Expires 5/29/2019.Save $5.00. Save $3.00 when you purchase ANY ONE (1) Billy + Margot® Refrigerated Rolls 7 oz. Any variety. .Expires 5/29/2019.Save $3.00. Save $7.00 when you purchase ANY ONE (1) Billy + Margot® Dry Dog Food 10 lb Bag. Any variety. .Expires 5/29/2019.Save $7.00. Save $4.00 when you purchase ANY ONE (1) Billy + Margot® Refrigerated Rolls 1.5 lb. Any variety. .Expires 5/29/2019.Save $4.00. Save $1.50 when you purchase ANY ONE (1) Billy + Margot® Dog Treats. Any variety. .Expires 5/29/2019.Save $1.50. Save $1.00 when you purchase ANY ONE (1) Billy + Margot® Wet Dog Food. Valid on cans or pouches, any variety..Expires 5/29/2019.Save $1.00. Save $10.00 when you purchase ANY ONE (1) Billy + Margot® Dry Dog Food 20 lb Bag. Any variety. .Expires 5/29/2019.Save $10.00. Save $5.00 when you purchase ANY ONE (1) Billy + Margot® Dry Dog Food 4lb Bag. Any variety. .Expires 5/29/2019.Save $5.00. Save $1.50 when you purchase ANY ONE (1) Atkins® PLUS Protein & Fiber Shakes. Any variety..Expires 4/25/2019.Save $1.50. Save $1.50 when you purchase ANY ONE (1) Atkins® Protein Powder. Any variety..Expires 4/25/2019.Save $1.50. Save $1.00 when you purchase ANY ONE (1) Atkins® Protein Wafer Crisp Bars. Any variety..Expires 4/25/2019.Save $1.00. Save $5.00 when you purchase ANY TWO (2) Ocean’s Halo NoSoy Soy-Free Sauces. Valid only on 296 mL..Expires 5/9/2019.Save $5.00. Save $6.00 when you purchase ANY TWO (2) Ocean’s Halo Stir-Fry or Teriyaki. Valid only on 355 mL..Expires 5/9/2019.Save $6.00. Save $1.50 when you purchase ANY ONE (1) Atkins Endulge® Treats. Valid on any 5 pack..Expires 5/9/2019.Save $1.50. Save $3.00 when you purchase ANY ONE (1) Amazing Grass® Green Superfood®. Any variety..Expires 5/1/2019.Save $3.00. Save $1.00 when you purchase ANY ONE (1) Amazing Grass® Green Superfood® Effervescent. Valid on any variety, except Single Serve packets..Expires 5/1/2019.Save $1.00. SAVE $1.50 on any ONE (1) Excedrin® 20 ct. or larger. Use products as directed..Expires 6/16/2019.Save $1.50. SAVE $1.00 when you buy any TWO (2) Barilla® Ready Pasta pouches.Expires 6/2/2019.Save $1.00.